DC and Marvel have always been the two biggest comics publishers, and have always been trying to get an edge on each other. Whether it’s creating similar characters, or launching similar events at similar times, these two companies have always been competing. 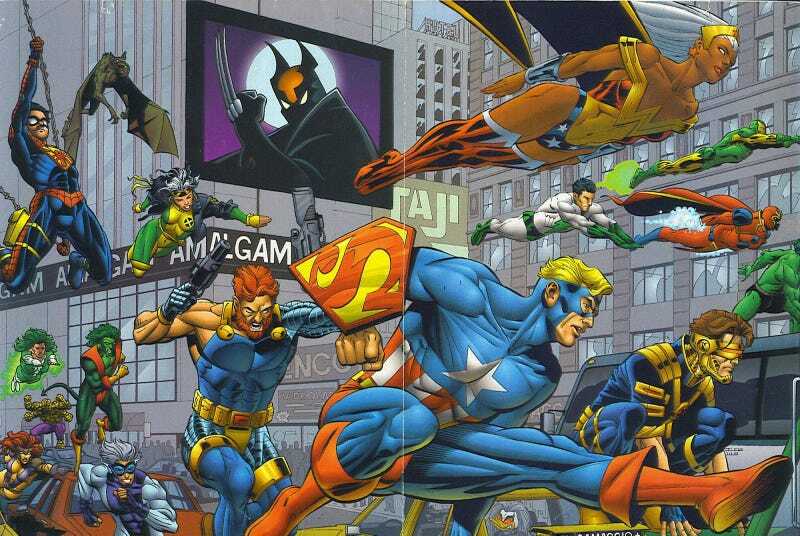 But during the 90’s, tons of crazy things were happening with comics, with craziest being DC and Marvel crossing over. Granted they had done this before with events like Teen Titans and X-Men, but none were as major as Marvel vs DC, and the subsequent Amalgam Universe. This all started in the DC vs Marvel miniseries, which saw heroes from both sides fighting each other to save their universe. That’s because both the DC and Marvel Universes had physical embodiments that wanted to be the only universe, otherwise they wouldn’t be unique. This caused each universe to choose champions, and the universe with more victories would get to survive. The battles between the characters were voted on by the fans though, which lead to some unlikely victories, such as Storm beating Wonder Woman. However, this didn’t matter, because in the third issue, the new character Access fused the DC and Marvel Universes to save both, thus creating the Amalgam universe. The Amalgam universe combined two or more characters from both universes, like Dark Claw (a fusion of Wolverine and Batman) and Super-Soldier (a fusion of Superman and Captain America.) This resulted in 12 single issues, which were treated as though they were series relaunches backed up with years of history. There were editors notes that referenced non existent stories, such as the Secret Crisis of the Infinity Hour, a combination of Marvel’s Secret Wars and Infinity Gauntlet, and DC’s Crisis on Infinite Earths and Zero Hour. There were even fake letter columns, to make it seem like a real series. None of these had any plot significance except for that of Doctor StangeFate, a combination of, well, that’s obvious. This had the aforementioned Doctor trying to stop Access from unfusing the worlds, after seeing that the sum was worse than its parts. In the final issue of DC vs Marvel, Access does just that, and convinces the two universes to stop fighting. But that wasn’t the end of the Amalgam universe, as just one year later there would be 12 more issues, but with set up for them this time. These had some returning heroes, such as Super-Soldier and Spider-Boy, as well as new heroes, like Lobo the Duck and Man-Thing. Following these stories, there were two more miniseries, those being All Access and Unlimited Access, which both toted some new amalgamations. While these stories may have been the epitome of 90’s comics, with gimmicks and bad costumes, they aren’t entirely terrible. While it’s easy to make fun of any of the terrible parts, there are a few times where the stories can be genuinely intriguing, most notably during the miniseries, rather than the amalgamations. Small details like Thor and Shazam both praying before a fight, or Robin and Jubilee’s romance really show how these stories could have been great, if they weren’t written in the 90’s. And in the later miniseries, it mostly boils down to Marvel and DC characters working together, until they fuse in the final issue. Overall, these stories were far from good, but it’s undeniably fun to see who gets fused together and seeing the crazy, over the top designs. And while something like this would almost never happen between DC and Marvel these days, there are more Amalgamations on the way in the Marvel Universe. This is due to the current Infinity Wars storyline, and in issue #3, all the Marvel characters will fuse with one another. But changing from Amalgam comics, all characters getting a seperate story will get not one, but two issues. The confirmed characters are Arachknight (Spider-Man and Moon Knight), Iron Hammer (Iron Man and Thor), Soldier Supreme (Captain America and Doctor Strange), Weapon Hex (Scarlet Witch and X-23), and Ghost Panther (Ghost Rider and Black Panther.) These issues will most likely show off some fused villains as well, similar to the days of Amalgam. While we may never again see a large DC and Marvel crossover, and especially not see the return of Amalgam comics, it’s interesting to see that even today, the practice of fusing heroes continues. Previous post: Women in Hip Hop : Do They Need A Co Sign ?